4.5/5Originally posted at Gypsy ReviewsHere’s what If I Lie will do to you – it’ll break your heart, make you rage at the characters, make you cry but you’ll still love it. This is a truly emotional story that talks about how much a secret could completely destroy you and makes you wonder – how far are you willing to go to keep a secret someone you loved asked you to? 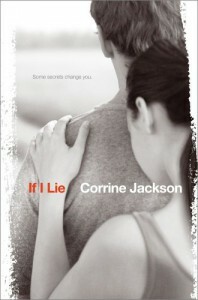 If I Lie deals with the complicated issues of a family and town who everyday wait for their soldiers to come home safe and sound and the toll that this takes on all of them.Quinn is one of the most strongest characters I have ever seen, she is willing to go through all that humiliation and name-calling, all for the sake of protecting Carey. It is so much more than that though because in Sweethaven, betraying a soldier is the last thing you would ever want to do and with everyone in Quinn’s life leaving her, I seriously admire how she can walk out in public knowing that every single person hated her for what she did. I’m not sure I could deal with that because it is so hard to be absolutely alone and to stand alone. At some times I just couldn’t believe Quinn would do that for Carey and thought it was incredibly selfish of him to ask her to do that because how could he not know what this would do to her? How everyone would treat her in that manner? At other times, I understood why he asked her of this because you could relate to both sides. His whole life would change if he let Quinn explain the secret. There wasn’t a best solution – only a solution you could live with.I was filled with hatred for the people in Sweethaven because no matter what, they should have listened to Quinn’s side of the story but then again, if that was you, if you saw someone cheat on another, would you be so forgiving? It really forces you to ponder what you would do in their shoes. How it is so common for us to look on only one side of things and to disregard the other. In a story, it is so much easier to see from two perspectives and choose the one you prefer. But in real life, there is only one side most of the times and you would only gravitate towards that side. I feel this quote really sums it up too.Sometimes a moment defines you, defines how people see you for the rest of your life.It won’t matter whatever you say because that moment has defined how people see you and they won’t see you any other way. There’s only that one perspective and no matter how compassionate we might think we are sometimes, it takes a lot to look at the situation from another person’s perspective.One of the best parts of the story is Quinn’s relationship with George and I just adored them together. They worked so well together despite the generation gap and George could really see the Quinn inside and read her inner thoughts. He understood her so well and it broke my heart in the end. In more ways than her father ever was, George was more of a father to her because he stood by her without even asking what the secret was, he knew what she did but never once judged her for it. He knew that she wouldn’t do this without a good reason.If I Lie talks about war and the toll war has on the families back home while their family members are off fighting for freedom and I love this quote in the book – “Freedom isn’t free”. That is so true, freedom comes so easily to us, sitting at home and watching from the sidelines and we never get the full impact of the situation over there. But for these brave men and women, what they experience over there is nothing we ever could have imagined and they pay the price for our freedom, for us to walk free every single day and living our lives happily. There is such a huge price to pay and also the families, they take so much toll on them emotionally and strain that sometimes it can never be mended back up again. Freedom comes with a price. But most of us don’t even realise how much was paid for it.If I Lie has wound its way up in my heart as one of my favourite contemporary reads of the year, albeit predictable it is a truly compelling and heartbreaking read. I highly recommend this book to everyone because this is one of the books you really need to read so you can understand people from another perspective because there are always more than one perspectives, we just don’t get to see them usually from where we’re standing.